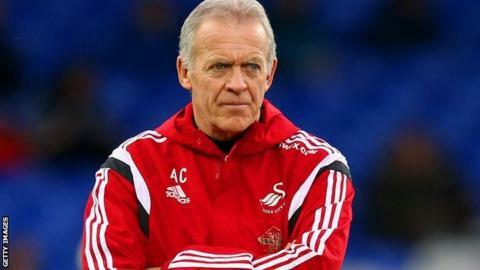 Swansea City coach Alan Curtis says the team still need to "kick on" to avoid relegation from the Premier League, despite an improved recent run. Saturday's 1-1 draw with Crystal Palace gave 16th-placed Swansea an eighth point from four games since naming Francesco Guidolin as head coach. "We're confident, but there's still a lot of work to do," Curtis said. But Swans goalkeeper Lukasz Fabianski believes the club will avoid relegation this season. "If you look at how we play, there has been a massive improvement. We will be fine," the Polish goalkeeper explained. Curtis urged cautious optimism, adding: "We have to go up a notch or two, between now and the end of the season, even though we have done quite well of late. "It's important we kick on a bit more. "The next six, seven or eight weeks will probably determine our future, with the games that we have got coming up. "It's a really crucial period. The quicker we can start winning games, the better." Swansea, who are currently four points above the relegation zone, host Southampton on Saturday before back-to-back away trips to Tottenham and Arsenal. They then face relegation rivals Norwich Cit at Liberty Stadium on 5 March. Swansea dominated for large spells against Alan Pardew's side on Saturday, who ended a run of five successive defeats thanks to Scott Dann's close-range finish. "I think we deserved more than a point, we dominated the game, were the much better team and created more chances," Fabianski added. "Apart from a little spell at the start of the second half, we were much closer to being the winning team. "We needed that second goal when we were 1-0 ahead. At the moment we are struggling to kill off the game a bit earlier - it will always be easier if we can get that second goal." Former Arsenal goalkeeper Fabianski expects Swansea to climb further from trouble in the coming weeks. "We look at the positives from the recent games, if we continue to play like we have in recent weeks, we will climb up the table for sure," he said. "We are on a nice run now, we aren't losing the games. "There is a slight disappointment not to beat Palace, but we would be more upset if were playing in a bad way and scraping for results. "But if we are the dominant side on the pitch, looking for the winner, we can't be too harsh on ourselves."